The Irish Independent became the first to recognise sporting excellence with our Sportstar of the Week award way back in 1950. The 2018 edition of our roll of honour is almost complete and now it’s time for our readers to choose who should be the Irish Independent Sportstar of the Year in association with The Croke Park Hotel. A trip for two to Old Trafford to watch Manchester United v Liverpool in February 2019. A VIP Hospitality trip to the Cheltenham Festival in March, 2019. A trip home to Ireland for one lucky winner and a guest living abroad to attend the awards. Prize to include Aer Lingus fights, accommodation in The Croke Park Hotel on the night of the awards and the option to extend the return flights until December 27 or 28 subject to flight availability. Two tickets for All-Ireland football final plus overnight stay at The Croke Park Hotel on the night of the match. Two tickets for All-Ireland hurling final plus an overnight stay at The Croke Park Hotel on the night of the match. Two premium tickets for All-Ireland camogie final plus an overnight stay at The Croke Park Hotel on the night prior to the match. Two premium tickets for All-Ireland ladies football final plus an overnight stay at The Croke Park Hotel on the night prior to the match. 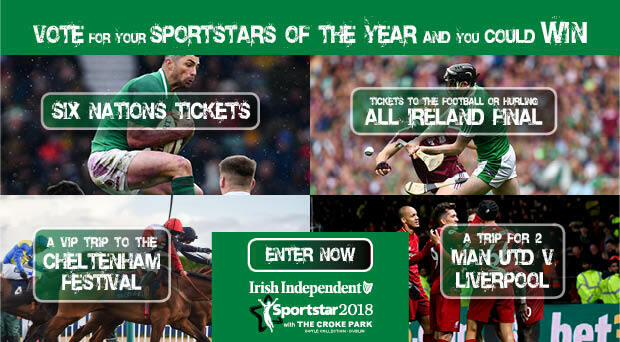 Two tickets to the Irish Independent Sportstar of the year awards, with an overnight stay in the Croke Park Hotel. Two tickets to Ireland's 2019 Six Nations home games in the Aviva Stadium, Ireland v England, Saturday February 2 & Ireland v France, Sunday March 10. A dream trip for two to Washington DC, with flights compliments of Aer Lingus and accommodation for four nights in The Dupont Circle courtesy of The Doyle Collection. A weekend for two in a Doyle Collection hotel in London, with return flights to London (flying into either London Heathrow, London City or London Gatwick) compliments of Aer Lingus. A VIP day at the 2019 Galway Races Summer Festival on the opening day of their 150th event Monday 29th July with over night accommodation with breakfast for 2 guests sharing on Monday 29th July at the Connacht Hotel. A trip for two to The River Lee Doyle Collection hotel in Cork. No cash alternatives will be offered and the Editor’s decision is final. We want you to vote for the Sportstar of the Year, Young Sportstar of the Year, Team of the Year and the Sports Magic Moment of the Year. You must choose your Sportstar of the Year from our Sportstar of the Week winners and the Young Sportstar of the Year from our list of nominees (below) along with The Team of the Year and the Magic Moment of the Year. You must vote in all categories to be eligible for the prize draw. The closing date is Sunday, December 16. Aer Lingus, Ireland’s only 4-Star airline now flies direct to 15 North American destinations from Ireland. From Dublin, Aer Lingus operates daily flights direct to Washington. Check out aerlingus.com for further information. A VIP trip to Cheltenham for four people. A trip home to Ireland for one lucky winner and a guest living abroad to attend the awards prize to include Aer Lingus fights, accommodation in The Croke Park Hotel on the night of the awards and the option to extend the return flights until December 27 or 28 subject to flight availability. One winner chosen will win a pair of tickets to Ireland v England, February 2nd & Ireland v France, March 10th. A weekend for two in a Doyle Collection hotel in London, with return flights to London Heathrow compliments of Aer Lingus. A VIP day @ the 2019 Galway Races Summer Festival on the opening day of their 150th event Monday 29th July with over night accommodation with Breakfast for 2 guest sharing on the Monday the 29th of July at the Connacht Hotel. Enjoy a delicious corporate lunch for two people with fantastic views of the racetrack overlooking the Winning Post. Enjoy the comfort of your own reserved table, a beautiful meal, fine wine and an incredible atmosphere. The competition runs from Saturday, November 17th to Sunday December 16th at 11.59pm. Trip to Manchester: Match tickets will be for the HOME Man United part of the ground and No Liverpool Colours are permitted. Package will be finalised once the match has been scheduled. Accommodation is normally for the Saturday night if the match is played on Saturday. If the match is on a Sunday depending on the time of kick off it can be a Saturday or Sunday night stay. Monday night games will always be accommodation on the Monday. Flights are subject to availability at the time of booking. Two names must be submitted at the time of winning the prize. Any changes to flight or names are at a cost to the prize winner. Prize is not transferable. Trips to Washington & London, flights are subject to availability and travel excludes the months of July and August and may exclude key holiday periods such as Christmas and bank holidays etc. Baggage is included as part of the flight booking – 20kg/23kg baggage allowance per person depending on London/Washington, seat assignment is not included in the booking, valid for 12 months. The destination cannot be changed nor can the tickets be changed once issued. A trip home to Ireland for one lucky winner and a guest living abroad to attend the awards and fly home for Christmas along with accommodation in The Croke Park Hotel the night before the awards, Wednesday December 19th & the night of the awards and the option to extend trip to Dec 27th or 28th subject to flight availability. Winner chosen must be available to travel on the dates specified (19th, 20th, 27th, and 28th), no alternatives will be offered. This winner of this prize will be chosen earlier than the others as Independent News & Media PLC will need to contact to arrange flights and accommodation. A winner for this prize will be chosen on Thursday, December, 13th. A trip to Cheltenham for 4 people flying directly with Aer Lingus on Wednesday morning, March 15th and returning Wednesday evening, March 15th, access to the Horse & Groom, package includes morning coffee and breakfast bites, 3 course pub lunch, afternoon tea, selection of classic British cheeses, complimentary bar including house wines, spirits, beers and soft drinks, no flight alternatives, seat assignment is not included in the booking, baggage is not included in the booking. All entrants will receive an email after the event announcing the winners. Winner will be contacted in advance of this. Winners personal details may be passed to the Prize provider. This will be to arrange collection or delivery of your prize.